If you’re looking for THE NUMBER ONE spot to get your eyes microbladed in Nashville, than you’re in luck because you just landed on the perfect page! We get it. You’ve seen the articles, the before and after pictures and JUST need a place that delivers those glamorous eyebrows like they promise. Well, lucky for you – we are that place. We go above, beyond, and a few feet extra in order to not just leave you “satisfied” but downright ELATED! We’ve been in business for a LONG time allowing us to gain the experience needed to perform a perfect microblade experience tailored to your brows! Get started by booking an appointment below or read on for more information! Bolder Eyebrows provide a put together look that provides the framework and structure to all of the other prominent features of a woman. But keeping up with your eyebrows everyday is a hassle; The cost of the make-up product themselves is a robbery! This is why getting permanent microbladed eyebrows will save you a lot of headache and cash down the road. Nashville Eyebrow Microblading gaurantees that your experience will be pleasant and smooth sailing – from the phone call to the service to the result. And at a price that you can brag about! It’s normal to want a change. Many people are paranoid by the idea of a needle being extremely close to their face, but the truth is that microblading is nearly painless! Let Nashville Eyebrow Microblading do all the worrying. We know how to make sure you’re pain free and comfortable throughout the whole process! Previous customers have compared this process to tweezing hairs at home, making it even less painful than threading or waxing. With microblading, you allow yourself to have the freedom from these types of temporary solutions. Microblading is a permanent eyebrow solution that allows you to be ready at ANY time of the day so you’re looking fabulous ALL the time. Book an appointment with the number one permanent make-up clinic in Nashville for eyebrow microblading and be our next ELATED customer! So dont delay, pick up the phone and give us a ring at the number below and we will set you with an appointment in minutes! Check Out the Services We Offer at Nashville Eyebrow Microblading Below! The new, cutting edge technique to turn your thinning eyebrows into the stunning thicker and fuller brows you’ve always dreamt of. This technique utilizes a super fine blade that allows us to get through the superficial layer of your skin and create hair strokes that look like your REAL brows. We apply a certain color pigment to mimic your natural color. We are the number one microblader in Nashville for a reason. All customer’s we’ve served have left with perfect brows and a big fat smile! Check out our picture gallery for a comparison! Ombre powder brows are the best option for clients that prefer a softer and mistier powder look for their brows. Ombre brows generally have a darker tail for the brows and fade into a light beginning. This subtle and all natural look creates a powder similar to that of topical powder makeup. Perfect for anyone that is currently already has some brow hair and is using make-up to fill their brows. We also include the option of adding microbladed hair strokes on top of this look if brow hair is extremely thin. Check out our picture gallery to see some of our most recent clients who have gotten ombre brows! As our customers’ demands changes, so do our services. Please make sure to come back to this page to see what new products and services we might be offering soon! We are always looking to bring in new trending services. We get it. You’re here to get your brows done. Not just have idle chit chat for hours. We’re nice people though. We like to make you feel welcome and at home. So we’ll get down to business as soon as you come in for your appointment. We understand that your time is valuable and you have other options. We respect that. And for that reason, we OVERDELIVER in all facets of our business – From the initial phone call to the appointment to the actual service and of course the results. Our staff is highly attentive and make sure that all customers are thoroughly comfortable and in love with their new look. And if not, we keep working till they are! Our esthetician Allison Klein is phibrow certified – meaning she has completed the rigorous microblading coursed formulated by the European company – Phibrows. It’s currently designated as the best international course that produces quality results from their trained artists. We have been a part of the cosmetic industry for several years. There is not a single situation we haven’t dealt with when it comes to microblading. No matter the color, size, or shape of your brows – we have tread that territory before and will do so again with seamless effort. You can rely on Nashville Eyebrow Microblading to not just leave you satisfied, but ELATED! Find out for yourself why we are the number one microbladers in Nashville, TN today! Give us a call and book an appointment! Our environment is built for comfort and relaxation so you always feel at ease during our service. We are here to cater to YOUR needs. We sit down and discuss exactly the shape and size of the brows you’ve envisoned for yourself. 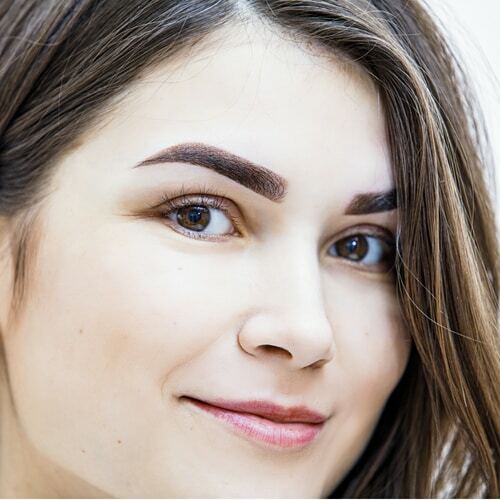 We will recommend shapes and sizes that will match best with your natural eyebrows but want you to make the decision for yourself to make sure you love your new look! All of our tools and equipment are state of the art and follow strict protocol for complete sanitation. The only thing we love more than giving our customers a perfect set of eyebrows is a big fat smile that they can wear along with it! Nashville Eyebrow Microblading will give you a new level of confidence with those set of bolder brows! Contact us today to set up an appointment! And if you simply like the way we write, check out our blog for all things makeup and beauty! We are constantly adding new content to add value to our customers so please check back regularly so you do not miss out on all things beauty! Microblading is a semi-permanent tattoing technique that will help thicken up your brows using a special tool called a microblade. The blade inserts pigment into the upper-layers of the skin building a texture similar to that of your own hair. This results in a natural and life-like fuller version of your old eyebrows. The effect can last anywhere from 12 months to THREE YEARS depending on certain skin types. The service can range from $300-$500 depending on the depth of the procedure. When you come in for an initial consultation, we can assess and give you an exact price! The number one thing you can do is RELAX! We know this could be a new and daunting experience for you – but let us do all the worrying. We’ve performed this procedure countless times and guarantee everything is smooth sailing. However, there are a few things you should avoid before getting microblading done on your brows: excessive Sun Exposure, blood thinners, botox for two weeks, and salon tanning! There are two sessions to complete for a full treatment. As this is a detail oriented process, the first session which involces adding pigment and reshaping the brows can last upto 2 hours. The second session will take place 4-6 weeks later and is used to stablize, adjust, and further define the brow from the first session. Nothing that you can’t handle. We use a special cream to numb your skin throughout the procedure. There will be a slight bit of redness afterwards but it should subside within the week. Overall customers can expect a slight amount of discomfort throughout but the results will be worth it! On rare occasions, people have an allergic reaction to some of the products being used. For this reason, as a safety measure, an allergy test will be performed on a small area of your skin before actual treatment to confirm your skin does not react adversely. It’s important to choose a practitioner that matches your style and has experience (Hint:us) doing the type of work that you want done on your brows. Adjustments can be made during touch-ups to get closer to the ideal shape and fullness that you have envisioned for your brows. Look at before and after pictures of customers and make to understand expectations and outcomes. Touch-ups are offered to ensure that your brows stay the way we had envisoned them for a long time. It’s important to have regular touch ups AFTER the initial work has been stabilized. This will take at least 4 weeks after the initial procedure. The skin is still vulnerable and is in the healing process before these 4 weeks. After getting your procedure completed, we will go over when would be an ideal time for you to come back for a touch up session. How long have we been in business? Why should you trust us? We have been a part of the beauty industry for more than 15 years! More than any other local microblader in Nashville. Check out our picture gallery for just some of the wonderful clients we have served thus far. We also have a 5 Star Google Review rating for one simple reason – We really care about servicing your eyebrows and provide real results.